Cetirizine, A well Known Drug. Cetirizine, the medicine that we usually consume for cold, itchy nose and watery eyes. This drug is very useful for all the above symptoms and we all have observed quick results. Some of us have even made it a habit to take cetirizine as and when we are just arriving at the symptoms of cold. But have we thought can it cause any side effects? And how worst or light it can be? Uses: This medication is an antihistamine that treats symptoms such as itching, runny nose, watery eyes, and sneezing from "hay fever" and other allergies. It is also used to relieve itching from hives. Cetirizine does not prevent hives or prevent/treat a serious allergic reaction (e.g., anaphylaxis). Dosing: Cetirizine should be taken at doses specifically directed by a physician. •Sleepiness occurs in 14% of patients. 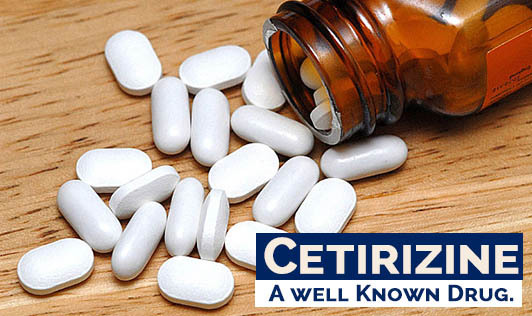 •Dry mouth, nausea, headache, fatigue, jitteriness and sore throat are infrequently reported with cetirizine. •In children, stomach pain and vomiting may occur. •A very serious allergic reaction to this drug is rare. However, seek immediate medical attention if you notice any symptoms of a serious allergic reaction, including: rash, itching/swelling (especially of the face/tongue/throat), severe dizziness and any trouble breathing. If you are self-treating with this medication, it is important to read the manufacturer's package instructions carefully so you know when to consult your doctor or pharmacist. (See also precautions section). It is always advised to consult a doctor and get a prescription before you decide to consume the drug. Always remember self medication is a crime!